The Elder Scrolls Online’s Tamriel hosts many races that are generally segregated from each other. Nords of Skyrim usually stick to their northern frosty mountains. Argonians settle in their Black Marsh. Khajiit rest in Elsweyr. But we know from playing other Elder Scrolls games that individuals of all races most definitely move around the map, mostly adventurers like our possible TESO characters. It is very possible from a canon perspective that my Redguard will wander through Morrowind. Unlike other faction-based MMOs, TESO has an interesting plan for those players with wanderlust. For today’s column, I’ve found a community member who explains some of the implications of factional divides for us. I’m also interested in how you will personally handle some of these factional issues. Like many of you, I choose the races that I play because I enjoy the history or the implied personality of those races. Sometimes that racial choice means that I will have a different starting zone from the other races. Lord of the Rings Online and World of Warcraft are examples of what I mean, but ultimately (and usually quickly) the races converge. Star Wars: The Old Republic and RIFT don’t differentiate the starting zones by race. SWTOR allows your class choice to determine that, and RIFT has one starting zone for each faction and that’s it. Although we don’t know the specifics of the racial divides in TESO, we do know that your racial choice determines not only determines your starting zone but the faction you join as well. This means that as you level your Breton, you will not be able to visit Windhelm. However, once you hit level 50 (the level cap), you can quest in one of the other factions’ zone, but unfortunately, you can not officially join that faction. Or at least we haven’t been told you can. Even though your Dunmer might be friends with an Altmer, when you both step into Cyrodiil, it’s on! I’m an altoholic by admission, but many people I know play only one character. They like to be able to explore every aspect of the game, but they don’t like to regrind a new character to max level. Although I don’t understand why they wouldn’t want to explore another storyline, I can respect that they want that character to be the best it can be. ZeniMax probably had those players in mind when it created TESO’s exploration system. I had my reservations when TESO was first announced. I thought it might have been a quick way for Bethesda to cash in on the MMO market, but perhaps ZeniMax is making a real MMORPG after all. 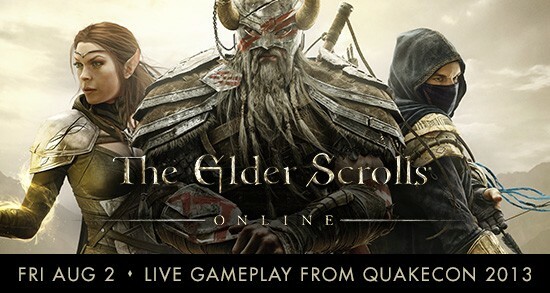 Sure, the company wants to entice existing Elder Scrolls fans, but the exploration system appears to be designed to attract MMO players as well. When I started this column, I knew that Massively’s Richie Procopio had played TESO at PAX East and at ZeniMax Studios. He’s a huge Guild Wars 2 fan, and his Tyria Talk videos are extremely insightful. But what I didn’t know is that he also has a series of YouTube videos called Tamriel Talk. I don’t want to make this section of the column to be about promoting other Massively employees, but Richie does not get paid by us to do this series, so I’m cool with highlighting him today. In MMOs like World of Warcraft and RIFT, the different factions cannot communicate with each other. Supposedly, this is to create a sense of loyalty within a player’s own faction. Personally, I’m not sure that that is a legitimate reason to cut off interfaction communication. ZeniMax could create a system like SWTOR’s in which spatial chat is open but players of opposing factions cannot send any other type of communication to each other. I believe that makes things more confusing, but at least they can talk to each other. In his premiere episode, Richie talks about the implication of cross faction talk or the lack thereof. Watch his video, then let me know what you think. Do you believe cross faction communication helps or hurts the overall feel of the MMO? How does that apply to TESO? Do you trust ZeniMax to do it right? (My loaded question for the day.) Talk to me in the comments. Last week, I asked which faction you planned to play when TESO launches and why. And nearly all the answers in the comments revolved around the races associated with that faction. I’m on board with that. But why are players loyal to that race? Infiniteduck1′s obsession with Khajiit started with the racial abilities these cat-people were given in earlier games. “Khajiit assassin/thief. Always and forever. Actually I first decided to play one because they have night vision and I could use the darkness to my advantage against bandit camps at night and in caves; instead of needing a light source, I could just hide in the shadows. Now it’s just more along the lines of tradition and has followed me into other games,” the web-footed one said. This week, I want to know how your race will affect your guild choice. Are you going to hunt down an all-Argonian guild so that you can hiss at each other all day long? Will you try to find a guild before the game launches, or is that something you do after you’ve played for some time? If you’re in a guild already, how are you compromising with players who might want to play a different faction because of the races they want to play?